The Parish Ministry Staff Team is delighted to welcome families who bring children for Holy Baptism, and adults who wish to be Baptised and Confirmed. Baptisms are usually conducted on a Sunday at either 11.30 am or 12.30 pm, except during the period of Lent when no Baptisms take place. In order to go through what happens in our Baptism service, families are invited to attend our Petrus Community Church at 5 pm on the 2nd Sunday of each month in the Parish Hall. This is a relaxed style of service designed for families and includes a meal. Following Petrus you will be able to talk with our Parish Priest about the Baptism Service. Godparents and sponsors are warmly invited and encouraged to attend Petrus with the parents. This is a great opportunity to not only go through the service, but to also get to know the staff here at Saint Peter’s and get to know the other families also bringing their children for baptism. Our Children and Families Worker, Louise Hay, is available to talk with families if you are unable to attend Petrus. 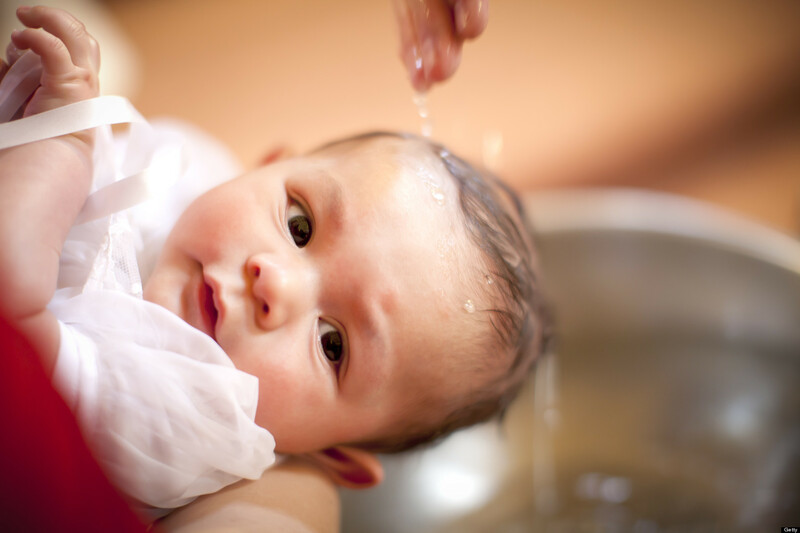 You can book a Baptism for your child or for yourself by completing the form on this website, or you can phone the Parish Office on (02) 4934 5303 for further details to help you through the process of booking your Baptism. You will be very welcome here, we look forward to hearing from you. Baptisms normally take place in our Saturday evening Vigil Eucharist at 6pm, and on Sunday mornings in the Sung Mass at 9.30am. Baptisms also take place in shorter services at 11.30 am and 12.30 pm, and at other times on Sunday and during the week where possible. There are often two babies or children baptised at each of these services, but never more than two (unless a family requests it). Parents and god parents or sponsors need to attend one of our Petrus Community Gatherings (on the Church site) which lasts for about an hour and half. The dates for the these gatherings listed in the online booking form. Except during the Season of Lent when there are normally no baptisms in Church, we baptise on every weekend throughout the year, and are always pleased to welcome many families who bring their children for Baptism. Please check with our friendly staff for these dates. Sometimes there are exceptional reasons for Baptisms during this period. If this is the case please contact us. Parents with god parents or sponsors participate in one of our Petrus Community Gatherings on a Sunday afternoon at 5 pm in the Parish Hall. The Petrus Community Gatherings are an informal church service, followed by a shared meal. During the meal there will be an opportunity for you to find out some more about Baptism and meet the Parish staff. The dates for these gatherings are listed in the online booking form, and you need to choose which gathering you will be attending when you make your online booking. If it is impossible for you to attend one of these gatherings you can request instead to meet one of our staff at our Music Time programme on Wednesday mornings, or our Play Time programme on Friday mornings. We will provide more details about these if you choose this option. You are most welcome to arrange for people to take photographs and/or to film the Baptism, this includes the use of flash photography. We realise that this is an important event for your family and we want you to have a record for the future. We ask that they do so in a way that does not disturb the service or draw attention away from the focus of what we are doing. If the people that you choose are themselves baptised (in any Christian Church) we will welcome them as god parents. If the people you choose are not baptised we will welcome them as sponsors. Both god parents and sponsors participate in the same way in the baptism service. Saint Peter’s Church is a unique historic building in the Hunter Valley. It costs thousands of dollars each year to maintain the building as a community resource in which baptisms, weddings, funerals and other community events can be held as well as being the home for the worshipping life of the congregations. We ask families bringing their children for baptism to make a contribution of $100 towards the ongoing preservation of the building. This contribution is used solely for the maintenance of the Church building. We want to ensure that the church building will still be here for your child’s children and indeed for their grand children to come here for baptisms, weddings and funerals. Adults coming for baptism are also asked to make a contribution, and are often able to give a larger donation. Families normally make this contribution by electronic bank transfer to St Peter’s Anglican Church, BSB 035-805, Account 00404647 prior to attending a ‘Welcome to Baptism’ evening, or bring their baptism contribution to the evening. Please indicate your surname in the electronic transaction. Cheques can be made payable to ‘The Anglican Parish of East Maitland’. If you are unable to make a contribution for any reason please discuss this with Elizabeth Brown (see the ‘Contacting Us’ section). This will not prevent us from welcoming you for baptism. Each year the Bishop of Newcastle or his Assistant Bishop visit the Parish to undertake an Episcopal Visitation and to administer the sacraments of Baptism and Confirmation for young people and adults (baptisms for babies and children take place throughout the year), and to receive members of other churches who now worship with us into membership of the Anglican Church of Australia. Any adult who has not been baptised can be baptised, and Confirmation will be offered to young people who are 12 years old and older on the same day. If you have not been baptised, or if you would like members of your family to be Confirmed or received please speak to Father David. Weekly preparation sessions normally take place in the month prior to the Bishop’s visit.